'SWAT Kats' to return, thanks to Kickstarter? This special report from VOM-DT: Channel Fur includes an interview between RingtailedFox and SWAT Kats blogger Rusakov Dekkamaster. I was contacted by Rusakov Dekkamaster (RD), after he noticed I ran a furry-themed internet television station, and thought it would help to get the word out on a potential SWAT Kats revival. Being a fan of the SWAT Kats universe, I was more than happy to oblige, and gained permission from RD to interview him about the prospective revival. Ringtailed Fox: So, how did you first hear about SWAT Kats? Rusakov Dekkamaster: I first learned about it when we got a newer cable package back in the summer of 2009. It looked interesting to me so I watched some of it. At first I wasn't too into it but I got hooked later on in the summer. RTF: I see. Was it the "furry fandom" aspect of SWAT Kats that drew you in, or are you simply into action-adventure series with everyday-people as heroes? RD: Oh, I love action-adventure series. Before I watched SWAT Kats, I watched The Centurions. SWAT Kats came on after that, which is how I was first introduced to it. I also liked the science fiction elements of it. RTF: I'm pretty excited about this new Kickstarter campaign to get SWAT Kats back on the air with new episodes. How did you first come across this? RD: It was through an email exchange with Christian Tremblay. The topic of bringing the show back had come up before, and he said there were plans to make new episodes. The Kickstarter campaign idea was the first concrete thing that was said about his plans. RTF: How did you get into contact with him? I can't imagine someone like him would have a public email address just lying about. RD: Actually, an earlier version of the Tremblay Bros. Studios website had a personal email address for him. I found it through an internet archive site (I believe it was the Internet Wayback Machine). The current version of the site no longer has his personal email account. RTF: What is that website URL, by the way? I'd like to check it out for myself, and I’m sure others would like to take a look too. So, if the Tremblay Brothers manage to raise enough money... will that be any guarantee that Warner Brothers will make new episodes? RD: www.tremblaybrosstudios.com... Of course there's no news about new episodes yet. Most likely news will come if/when the Kickstarter is successful. And there's no guarantee that Warner Brothers will pick up the series. Which is part of a fan campaign that I'm organizing. It's called "listen to the people" it will be a list of people who support bringing the show back. I urge as many people as possible to participate in it. RTF: The campaign would most likely have to raise a couple million dollars before Warner Brothers even thinks about it, since production costs for good-quality traditional animation can be quite high, even if we were to somehow cover the costs of production so Warner Brothers didn't lose a cent. How much is the Kickstarter goal, and do you think the fanbase will be able to achieve it? SWAT Kats is fairly-obscure, after all. RD: The goal is currently unknown to us. It could be just used as seed funding or something bigger. We just don't know yet. So I really can't say for certain whether the fandom can reach it or not. RTF: That's fair. In the event that Warner Bros. or Cartoon Network USA (or Teletoon, in my native Canada) are uninterested, where would that place the Tremblay Brothers? Would it be able to continue online in some form, like a webcomic or flash series? RD: It could, there are so many things that could happen that anything, from abandonment to a full fledged TV series can happen. RTF: Do you know who currently owns the broadcast rights to the series, and its spin-off and merchandise rights? RD: That's difficult due to conflicting reports. [Warner Bros. designer] Lance Falk said that Warner Brothers owns the broadcast rights. And Chris Tremblay says that he and his brother own the rights. It's possible that WB has broadcasting rights while the Tremblay brothers have the rights to creating a new series. It's also possible that rights are shared between the two. RTF: I believe you're right in that they either share rights, or have separate rights, depending on how the SWAT Kats are used. RD: I think that's pretty likely too. RTF: Now, say everything goes well, Warner Brothers says "alright, since you're fronting all the money for us, we'll have Cartoon Network be the distributor", and even line up some international broadcasters, ie. Teletoon, or Cartoon Network UK, how soon would we see a new series or new episodes? Or how long would it be before we hear any news, good or bad, from the Tremblay Brothers, regarding the success or failure of the Kickstarter campaign? RD: For new episodes, at least a year. It takes a while to make cartoon episodes. Failure or success of the Kickstarter campaign will probably come immediately after it's done due to the fact that campaigns that fall short are not funded. So failure really isn't an option in our case. RTF: You and I know what Kickstarter programs are, but for those that are scratching their heads, would you be willing to explain what they are and how they work? RD: Kickstarter programs are basically programs where, instead of getting corporate backing, projects get backing (initial or otherwise) from ordinary people donating a certain amount. The minimum donation amount is one US Dollar or equivalent. I would say the interview went quite well, and with any luck, SWAT Kats will see a revival of some sort in the near future. I wonder if a future show will also have to rely on such sales. I doubt Kickstarter funds alone are going to cover it. At least they have one dedicated fan. Rusakov's been at this for over a year. For their sake, I hope this pans out. At least they have one dedicated fan. Rusakov isn't the only fan who's tried to petition the powers that be to do something like this. It's been a process that's been on-again and off-again for almost twenty years (since the show was cancelled). Hundreds if not thousands have been involved since that time. Rusakov is just fortunate enough to be participating during a time when Christian Tremblay is in the mood to actually communicate with fans and do something instead of ignore them (as has been the case for quite some time). This isn't to detract from Rusakov's efforts, but to remind all that there have been many dedicated people whose shoulder's he's standing on. These fans have been keeping the SWAT Kats fandom alive before he arrived and will continue to do so if this effort fails. I hope that it doesn't fail, but past experience with numerous similar attempts make the odds seem rather slim. Also, being at something "for over a year" isn't that long in regards to SWAT Kats. Many of us have been at this for decades. In the name "SWAT Kats", is SWAT supposed to be an acronym? What does it stand for? Presumably Special Weapons and Tactics. Best of luck to them! That was a fun show. I would love for them to come out with merchandise, but as for the show itself, I'd rather they leave it alone. I highly doubt they'll be able to recapture what made the original so great. "I highly doubt they'll be able to recapture what made the original so great." We're not too worried because it's the original crew that's doing this. Christian and Yvon Tremblay (the creators of SWAT Kats), possibly Davis Doi (series producer), Glenn Leopold (writer) and George Booker (storyboard artist). And it's even possible (albeit improbable) that Lance Falk (also a writer) would come on board if the concept bears any fruit. As for voice actors, I'm currently following Barry Gordon (the voice of Jake Clawson/Razor) and Rob Paulsen (the voice of Hard Drive) on Twitter. Charlie Adler's (the voice of Chance Furlong/T-Bone) has a webpage, but I can't seem to find contact information. Even with the Tremblays involved, the likelyhood of it having the same feel isn't guaranteed. All those mentioned might not be involved crew wise. As for the original cast, while the VAs of the two SWAT Kats are still around, throughout the years many of the cast have passed on (Brock Peters, Keene Curtis, Roddy McDowell, Linda Cary... ) and who's to say the others will get involved as some no longer do voice work. Should this become a reality, let us hope replacements for crew and cast will be true to the show. They did come out with merchandise (such as action figures of Dark Kat, Dr. Viper, Chance Furlong/T-Bone, and Jake Clawson/Razor), but sales were far lower than expected, so they were discontinued and the show was cancelled shortly before season 2 was finished. While the toys have bad reviews by most of the fans, I doubt that was a major factor in the show's cancellation. The fact the toys didn't sell was because the show had a bad time slot and wasn't pushed enough. Shows like Dexter's Lab and Johnny Bravo were the ones given more attention to and made known in advertising. I never had a good feeling about Kickstarter in the first place it just a way for individuals to dupe themselves to throw good money to bad projects with very little return or on successful project with no return. I want my money back with interest. This is one of the former because SWAT CATS is own by Hanna-Barbera, and I do not recall any corporation being free with licensing. So if they do create and put out a new version without Hanna-Barbera blessing the project will be shut down by Hanna-Barbera leagal and you out of you so called investment. if it was the Hub or Cartoon Network this would be a different story. Thank you for making this point. While Hanna-Barbera no longer exists, Warner Bros. does, and is likely the entity that owns SWAT Kats. These details are going to make or break this campaign. It's time for the Tremblays to step up to the plate and make their case to the fans, with plenty of verifiable citations to show their authenticity. Agreed. 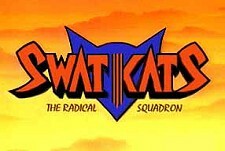 It is unclear if the Tremblays can even use the SWAT Kats without WB's permission as most times creators give up their rights when a show is produced. Looks like they had a separate discussion on Reddit, and will be having another on Thursday evening (10PM EST). The Tremblays actually own the rights to the show. That's good news... do you have proof that the Tremblay Brothers own the broadcast rights? I would, if I had their contact information, but I'll believe you on this until I see any evidence to the contrary. Christian Tremblay said during the Reddit discussions that they do, that they retained their rights during the original deal made years ago when SWAT Kats were produced. We can only take Christian's word for it that it is true.